September spells the end of summer. For many northern hemisphere gardeners, it also spells the beginning of the end for those annuals that have brightened their lives since spring. With September come the first bright leaves of autumn. Introducing flowers that are in season in September into your garden will capitalize on the color unfolding overhead. Many of these late bloomers will continue to shine well past frost. Heath aster (Aster ericoides), a perennial hardy to minus 40 degrees Fahrenheit, grows from 1 to 3 feet high and wide. At home in drought and poor soils, it blooms in September and October. ‘Blue Star' is a heath aster cultivar with narrow, stiff green leaves up to 3 inches long. Its tiny flowers have light blue petals (rays) around bright yellow flat central disks. They grow in heavy sprays along its upright stems. Butterflies flock to ‘Blue Star.' Use this largely disease-and-pest-resistant plant, suggests the Missouri Botanical Garden, in borders or prairie or rock gardens. It likes sun and well-drained, dry or averagely moist sand or clay soil. 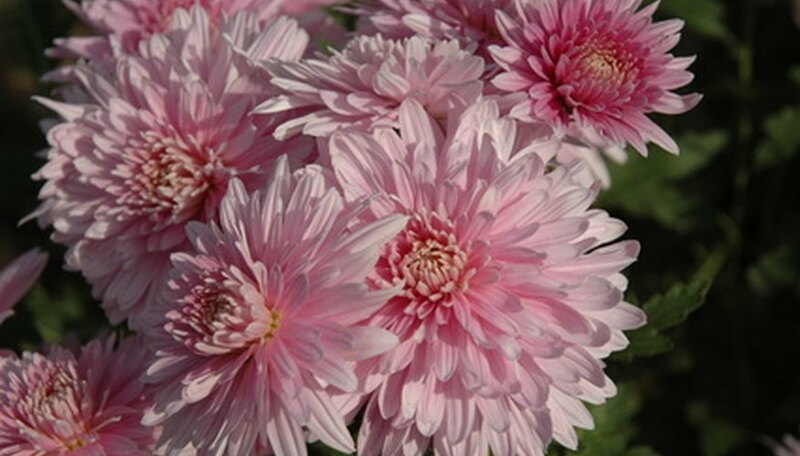 Chrysanthemums are classic fall garden choices. Hardy to minus 20 degrees Fahrenheit, these compact, mounding plants have pungently fragrant green leaves. Their variously shaped blooms come in warm and cool colors, many of which complement or contrast strikingly with autumn foliage. Dark Triumph is a densely branched, hybrid cultivar standing 18 inches to 2 feet high. From September to frost, according to the Missouri Botanical Garden, it has abundant, flat two-toned bronze blooms. This mum is vulnerable to damage from spider mites, aphids, rust, powdery mildew, wilt and root rot. Plant it in the spring so its roots establish by fall. Prevent early bloom and legginess by pinching back stems as buds appear until early July. Dark Triumph likes fertile, humus-rich, well-drained soil. Keep moist and provide afternoon shade where summers are hot. Cut back to 6 inches from the ground and cover with an evergreen bough mulch during winter. Autumn crocus (Colchicum Byzantium) is a bulb plant native to the Middle East. Growing just 3 to 6 inches high and wide, it produces dark green lance-shaped leaves in spring. Foliage disappears by summer. The dormant plants sleep until fall, when their leafless stems emerge. Each stem has a pinkish-lilac, trumpet-shaped 2-inch flower. One bulb may produce 20 blooms, according to the Missouri Botanical Garden. Autumn crocus is hardy to minus 30 degrees Fahrenheit. Plant bulbs in August, 3 inches deep and 6 inches apart. Give them sun to partial shade and averagely moist, well-drained soil. Use these plants as patio edging or in parts of the landscape where summer-blooming flowers are declining.